The use of gene therapy for heart failure is currently being investigated. Heart failure is a major public concern which affects an estimated 1% of the Western world, including over 5 million Americans with over half a million new cases each year. The current medical treatment of heart failure includes proven beneficial medicine such as beta-blockers, Ace inhibitors, angiotensin 2 receptor blockers alone or combined with Neprilisyn inhibitors (Entresto), Ivrabadine (Corlenor) and diuretics. However, even after following all these guideline proven therapies, some patients still run out of options and continue to have severe and debilitating heart failure. Gene therapy provides a novel strategy for targeting abnormalities in the heart cells that adversely affect the heart function. Over the last few years, novel molecular mechanisms associated with heart failure have been discovered creating new targets for therapeutic interventions. Some of these cannot be affected by medicine but could be ideal for a gene therapy approach. Heart failure is a chronic, progressive disease and to be effective, gene therapy must target as much heart muscle as possible and the therapy needs to be sustained over a long period of time. Gene therapy for heart failure: how does gene therapy work? Gene therapy introduces a genetic material (DNA) into the cells to make a beneficial protein. In heart disease, gene therapy may be able to place a normal copy of the gene into the human cell to change how the cell works with the end goal of correcting the disease. 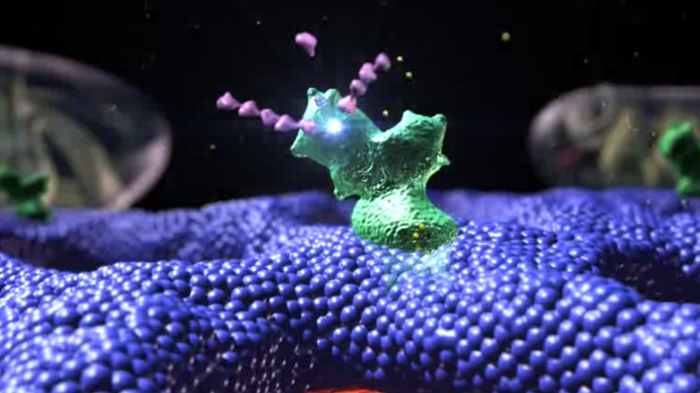 To insert the gene into a cell, gene therapy uses a vector or carrier to introduce the gene into the human cell. Non viral vectors are relatively easy to produce and consist of plasmid (DNA that can reproduce). The vector lets the gene take a piggyback ride on it to reach the diseased cells. Once there, it is absorbed into the cells to help stimulate the body to make more beneficial protein. They are delivered by direct administration, as in this example of the patient treated in the STOP-HF JUVENTAS trial. In this case, stroma cell-derived Factor-1 (SDF-1) was injected at multiple sites inside the left ventricle. By avoiding exposure to blood it prevents some weakening of the vector and does not affect other organs as much. Viral vectors or carriers have become the preferred method of delivery of gene therapy because of their high efficiency and capability. The adeno-associated virus (AAV) has emerged as the preferred factor because it is safe and can have a long term effect. This AAV virus is not known to cause disease in humans. Delivery of genetic material through the circulation can be accomplished either by direct injection through the coronaries as shown in the following images. It can also be injected through bypass graft to the coronaries or a retrograde infusion through the coronary sinus into the venous system of the heart as demonstrated in the next image. This is an example of a patient enrolled in the RETRO-HF JUVENTAS trial where a gene plasmid agent (liquid containing pieces of genetic material (DNA)) was infused through the coronary sinus. Administration of these vectors could also be done intravenously but it’s application is limited because of poor cardiac specificity of the current vectors. The dilution into the systemic blood and the uptake by the liver, lung and spleen before it gets to the heart is an important limitation. Gene therapy targeting the beta adrenergic system. The adrenergic receptors are targets of catecholamines (Norepinephrine, Epinephrine) produced by the body and many medications like beta-blockers that are used to treat hypertension and heart failure. Heart failure leads to down regulation of these receptors. Several gene based experiments showed that genetic modification of the myocardial beta-adrenergic system can increase heart function. Adenyllyl-cyclase type-6 (AC6), dominant in the heart muscle cell, is a protein on the heart cell membrane that increases the energy to the heart and improves pump function. AC6 is reduced in heart failure. We can increase this pharmacologically (Dobutamine or Milrinone) and improve heart function, but at the expense of increased mortality in some heart failure patients. Increase in expression of AC6 can restore LV function, improve the way the heart cell works and reduce arrhythmia in experimental models of cardiomyopathy. A recent clinical trial demonstrated that intracoronary infusion of AC6 in patients with heart failure improved ejection fraction at 4 weeks, but not at 12 weeks. There were no increase in arrhythmia and the admission rate for heart failure was reduced compared to placebo. In the very near future, our group at CardiologyPC plan to enroll patients in a phase 3, multi-center, double-blind, placebo controlled study of AC6. We will test the hypothesis that single intracoronary infusion in patients with advanced heart failure can reduce hospital admissions and reduce cardiovascular and all causes of death. Heart failure is characterized by multiple defects in handling the calcium involved in excitation and contraction of the heart cells. 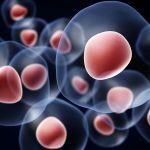 Abnormal adjustment of calcium inside the cell can be attributed in part to decreased activity of an enzyme called SERCA2a. 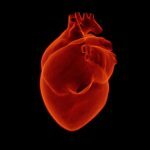 In heart failure, there are lower levels of this enzyme in heart muscle cells which makes the heart not contract as much as it should. . Increasing the enzyme in the heart muscle cells of animals with heart failure improves heart function. 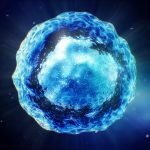 Preliminary data showed that intracoronary infusion of (AAV1) adeno-associated virus delivering the gene of this enzyme to the heart improved symptoms, functional status and LV function in patients with advanced heart failure. CUPID phase 2b trial was a multicenter, double-blind, placebo control, randomized study of AAV1/SERCA2a (attenuated virus and the gene) in patients with advanced heart failure. Patients ages 18-80 with stable class 2-4 heart failure with ischemic or nonischemic cardiomyopathy were enrolled. The following images depict the coronary angiogram of one of our patient at CardiologyPC. He is a 59-year-old patient who underwent bypass surgery 12 years prior and a biV-ICD 3 years prior to enrollment. The patients was hospitalized 5 months before his enrollment in CUPID because of heart failure decompensation. 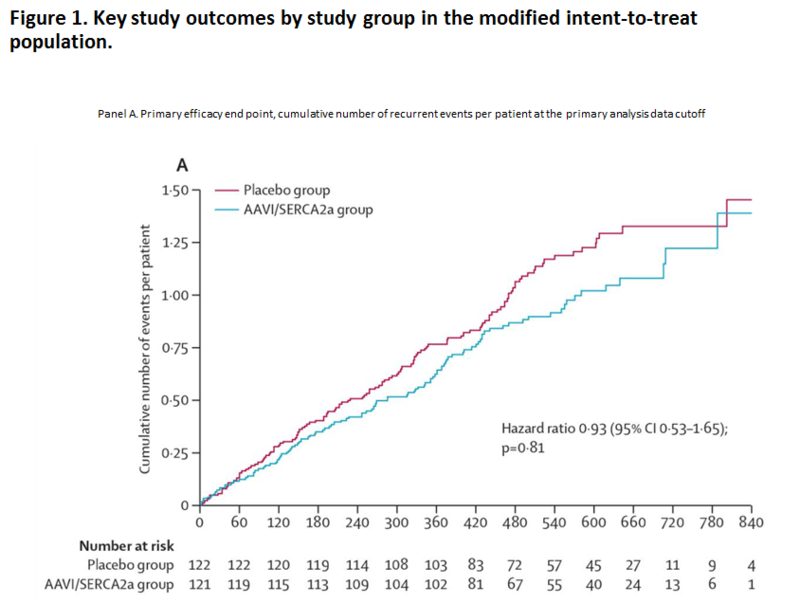 The trial was neutral and failed to show that the administration of AAV1/SERCA2a reduced recurrent heart failure events or terminal events in patients with moderate to severe heart failure and reduced ejection fraction. The therapy may have failed because it was not getting enough to the heart muscle cell. A Reengineered viral vector may make it more effective in delivering the new gene to the heart. Not only do you have to get the virus to the heart, but you have to have affected enough cells to make a difference. 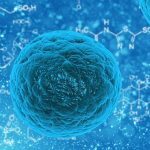 Stromal cells are connective tissue cells contained in any organ. 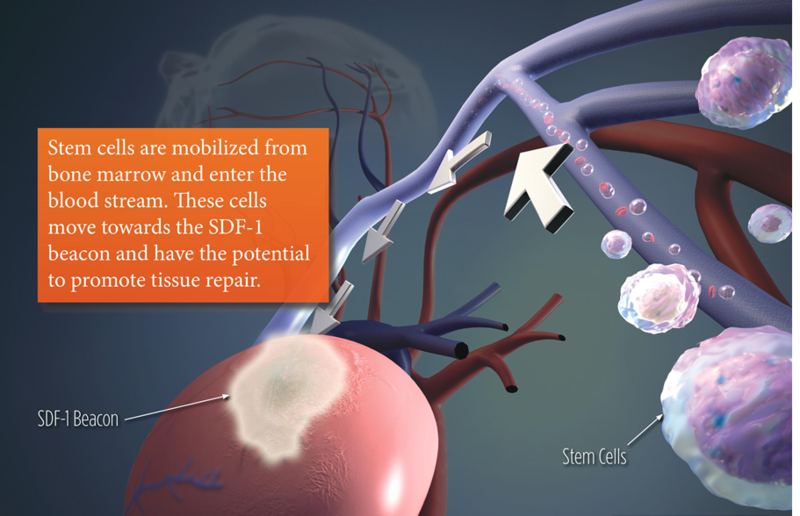 The stromal cell derived factor-1 (SDF-1) promotes tissue repair through mechanism of cell survival, recruitment of the body own’s stem cells and formation of new blood vessels. The SDF-1 has emerged as a therapeutic target in patients with coronary disease due to its ability to promote the homing of stem-cell to infarcted or damaged heart muscle (figure below). The STOP-HF JUVENTAS trial was a phase 2, double-blind, randomized, placebo controlled trial to evaluate the safety and efficacy of a single treatment of JVS-100 (liquid containing DNA to make a protein SDF-1) delivered via intra myocardial injections to patients with heart failure and coronary disease. Ninety three patients were randomized of which 62 received the medication. The primary endpoint of improved exercise and quality of life was not met at 4 months after treatment. 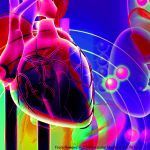 Patients with the most severe reduction in ejection fraction tended to improve slightly more. Following this, RETRO-HF trial was initiated as a clinical phase 1/2 study to test the safety and efficacy of delivering JVS-100 via retrograde coronary sinus infusion to treat heart failure patients with coronary disease. One of the patients enrolled was a 76-year-old man who suffered a myocardial infarction in 1991. He was participating in a hypertension trial at that time and the research physician always reminded him that if he had any problem with chest pain that he should call 911 and go to the emergency room right away. 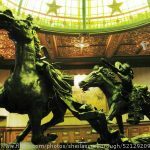 On New year’s Day 1991 he was carrying a TV to the living room to watch the football game and started experiencing severe crushing chest pain. He went to the emergency room and was found to have an anterior STEMI and was treated with t-PA. He was managed medically and in 2013 he had an episode of heart failure exacerbation and was admitted to the hospital. Cardiac catheterization revealed that the LAD was occluded but perfused through collaterals and the remaining of his coronary arteries showed only mild coronary disease as seen below. His echocardiography showed an apical aneurysm and an ejection fraction at 40%( below). In 2014 he was enrolled in the RETRO-HF study and underwent retrograde infusion of JVS-100 via the coronary sinus. The study was neutral and failed to show improvement in exercise capacity or quality of life. Our patient is now 80 yo and is doing well on medical therapy. He is responsible for our writing about the research activity at CardiologyPC and in Myheart.Net. We appreciate the involvement and dedication of our patients to help us improve the medical care and treatment of patients with advanced heart failure. Great info You have a knack of explaining difficult thing in simple terms. For us who are dumb as rocks you do a great service. Thanks Doc. Just wanted… Anticipate it would soon save weaker hearts…God bless.